Even though The Karate Kid series came out slightly before my time, due to my childhood love of Teenage Mutant Ninja Turtles and even inferior karate films like The 3 Ninjas, you would think I would have seen at least the first film in this series by now. Nope, when I received The Karate Kid Part III/The Next Karate Kid Double Feature from Mill Creek Entertainment to review, I had yet to see a single film in the franchise. I watched the first two films to catch up before watching these and my thoughts on them were pretty positive, though I do think they might be a tiny bit overrated. I knew that the two films in this set were by far the weakest parts of The Karate Kid franchise but I still wanted to give them a chance anyway. Overall, while they are definitely pretty average I don’t think they are quite as bad as they are made out to be. Yes, the franchise was getting pretty repetitive at this point but they aren’t that much worse than The Karate Kid Part II. The Karate Kid Part III marked the last appearance of Daniel LaRusso (at least until Cobra Kai premiered on YouTube Premium last year). In this film, Cobra Kai leader Kreese is back (after a brief appearance in the sequel) and this time he’s even more pissed off than usual. His dojo and life have both fallen apart, probably because he assaulted a student in the previous film. However, instead of taking responsibility for his actions he decides to blame his problems on Daniel-san and Mr. Miyagi. Luckily for him, one of his old war buddies (Terry Silver) is rich and somehow has nothing better to do with his life than try to get revenge for Kreese by attempting to ruin the lives of Daniel and Miyagi. He hires a karate star named Mike Barnes to try to embarrass Daniel when he attempts to defend his title at the All Valley Karate Tournament. However, Mr. Miyagi convinces Daniel not to compete which could foil this ridiculous plot by the villains. Of course, this means that we get another grown man who spends his time harassing a teenager to try to get him to compete in the tournament. I will fully admit that the plot in The Karate Kid Part III is completely ridiculous. It’s one of the stupidest, most convoluted plans I’ve ever seen in a film and it often doesn’t even make any sense. Even if Daniel would lose, how in the world would unsuccessfully defending his title embarrass him? However, is it really that much more ridiculous than Daniel being harassed by an Okinawan man he had just met in the sequel? I would say no. Honestly, if you can ignore the ridiculous premise this film has it actually makes for good B-movie material. All three of the villains in this film are cartoonishly evil and completely over-the-top. Thomas Ian Griffith is especially entertaining as Terry Silver. His character is absolutely ridiculous and Griffith really chews the scenery. It’s just hilarious to see a successful businessman and an adult playing a teenager trying to get Daniel to sign a form (which he could easily say was signed under duress anyway). After the critical failure of The Karate Kid Part III and the much lower box office returns it fetched, the series went into hibernation for five years. However, even back in the ’90s movie studios wouldn’t let a lucrative franchise die off after just one failure. In 1994, the franchise returned with The Next Karate Kid, which starred a young Hilary Swank as the titular character. Like Daniel-san, Swank’s Julie Pierce is a trouble teen. Julie lost both of her parents in a car accident and has serious anger issues with the world. The only thing she really cares about is an injured hawk she calls Angel. Mr. Miyagi is in town for a ceremony in honor of his regiment’s service in World War II and decides to try to help Julie turn her life around. Similar to Daniel, Julie is being harassed by people at her school, this time by members of the Alpha Elite school security team. When Julie is suspended from school for two weeks, Mr. Miyagi takes her to a Buddhist monastery to continue her karate training (she learned the basics from her father). While the main character has changed in this film, its still pretty much the same movie as the first three in the franchise. You still have a troubled teenager being bullied (for pretty much no reason) who has to learn karate to defend themselves. I would say The Next Karate Kid spends a bit less time on the random harassment and more time on character development and karate training though. Like The Karate Kid Part III, I would say this film is definitely below average but I do think the critics are a little too harsh on it. I think it is a slightly better film than the previous one in terms of quality (outside of the terrible slow-motion effects it uses during some of the karate scenes) but it also isn’t quite as entertaining in a “so bad, it’s good” way. There are still some funny moments, like Miyagi at the dress store and the humorous scenes involving the Monks (Miyagi and the Monks would have made for a better spinoff than this). While the difference between the DVDs and Blu-rays of these films is still notable, The Karate Kid Part III/The Next Karate Kid Double Feature isn’t even close to one of the best looking Blu-rays I’ve seen. In fact, I would say it is below average in this area (even compared to other catalogue titles I’ve seen on the format). Both films have been released on Blu-ray before (though in America only as BD-R releases) and while I don’t own them (and thus can’t compare this release to them), I have heard that the individual releases look much better. However, this release is also much cheaper than buying even just one of those ones (they both still sell for over $20 on Amazon). For those of you who want to own the entirety of The Karate Kid on Blu-ray, this might be the release to get since you likely won’t watch these two films as much as the first two and this is the much cheaper option to upgrade them. Yes, the video quality isn’t as good but do you really need to see these two films in the best possible picture quality anyway? I knew going into this review that these two films were much lower-rated than the first two films in the franchise. After watching them, I would say they are definitely inferior to the original but I don’t think the step down from Part II to these films is as big as you would think. I wouldn’t actively recommend them to most audiences but if you like karate films and don’t mind cheesy, B-movie like antics they might be worth watching. 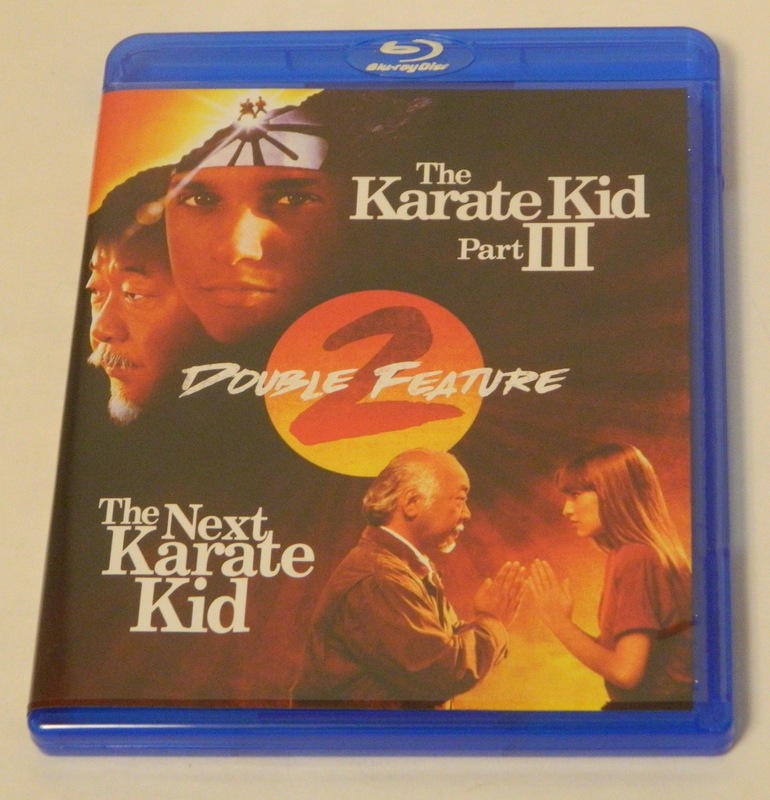 The Karate Kid Part III/The Next Karate Kid Double Feature was released on Blu-ray on January 8, 2019. We would like to thank Mill Creek Entertainment for the review copy of The Karate Kid Part III/The Next Karate Kid Double Feature used for this review. Other than receiving the review copy we at Geeky Hobbies received no other compensation. Receiving the review copy had no impact on the content of this review or the final score. Both movies are quite fun in a B-movie kind of way. Neither film is actually good (though they aren't quite as bad as the ratings they've received). The video quality on this release is acceptable but not quite what you would hope for from a Blu-ray release.